This 18W USB Type-C PD Wall Charger with USB Type-C Cable Kit from B&H gives you everything you need to charge your USB Type-C devices at home or on the go. 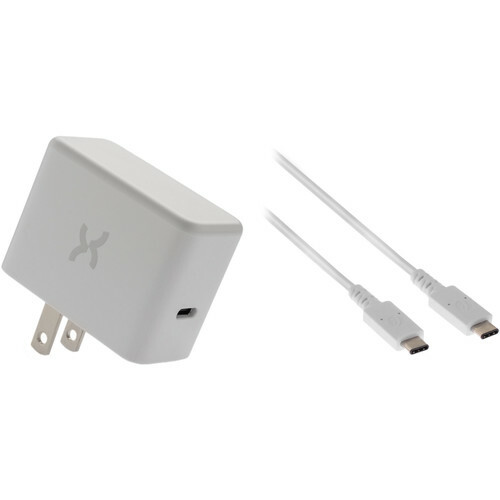 You get a compact Xuma 18W USB Type-C Wall Charger and a 6' Pearstone USB 2.0 Type-C Cable. The reversible USB Type-C port on the charger features USB PD (Power Delivery) for fast charging that delivers up to 18W of power to your compatible devices, such as a Nintendo Switch (excluding dock), smartphones, and tablets. The prongs of the adapter fold up for easy travel, and the bottom-facing port helps you use it on hard-to-reach outlets. Charge your USB Type-C devices at home or on the go with this 18W USB Type-C Wall Charger from Xuma. The single USB Type-C reversible port features USB PD fast charging that delivers up to 18W of power to your compatible mobile devices, such as the Nintendo Switch (excluding Switch dock), flagship smartphones from Apple, Samsung, and Google, as well as any other mobile device that charges via USB Type-C. Compact, lightweight, and featuring foldable prongs, this power adapter makes for an ideal travel companion. At home, the 1.6" deep slim-fit design and bottom-facing port help to let you use this charger on hard-to-reach outlets, such as those behind furniture that may otherwise go unused. This USB 2.0 Type-C Charge & Sync Cable from Pearstone is a USB-IF certified cable designed for your USB Type-C devices. Adhering to USB 2.0 standards, it can transfer data at speeds of up to 480 Mb/s, so you'll spend less time waiting around. Moreover, it supports up to 5A of power output, which allows you to recharge or power your device via a computer or wall adapter, including a Macbook or Macbook Pro with USB-C or Thunderbolt 3 plug. It's also EM and RF shielded to prevent interference from other nearby devices. Box Dimensions (LxWxH) 5.1 x 5.0 x 0.5"